Transparency Market Research (TMR) has published a new report titled, “Veterinary Dentistry Instruments & Equipment Market - Global Industry Analysis, Size, Share, Growth, Trends, and Forecast, 2018–2026”. 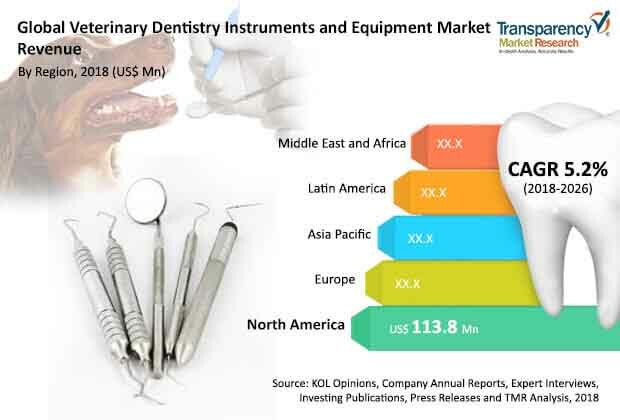 According to the report, the global veterinary dentistry instruments & equipment market was valued at US$ 312.9 Mn in 2017 and is projected to expand at a CAGR of 5.2% from 2018 to 2026. The report suggests that rise in awareness among pet owners about the oral health of their companion or farm animals is likely to spur demand for veterinary dentistry instruments & equipment during the forecast period from 2018 to 2026. North America and Europe are likely to account for significant shares of the global veterinary dentistry instruments & equipment market. This is attributed to introduction of technologically advanced veterinary dentistry instruments & equipment in these developed markets by key players. Wide distribution network of major players and increase in market penetration of emerging players are likely to boost the growth of the veterinary dentistry instruments & equipment market in Asia Pacific from 2018 to 2026. Improved understanding of the best practices of veterinary dentistry among veterinarians and efforts taken by various private and public organizations to set a standard for veterinary dentistry are the key factors fueling the growth of the global veterinary dentistry instruments & equipment market. The emotional bond developed between owners and their pets makes them seek a standard and quality care for the pets. According to Pet Secure, people in the U.S. spend around US$ 50 Bn on their pets per annum. According to the journal The Australian, pet owners in Australia spend on an average US$ 12 Bn per annum on their pets. The frequency of visits to veterinary clinics for regular check-up of pets has increased owing to significant rise in per capita spending on pets. This is likely to generate demand for sophisticated procedures in veterinary dentistry, which in turn is expected to propel the veterinary dentistry instruments & equipment market. The report offers detailed segmentation of the global veterinary dentistry instruments & equipment market. Based on equipment, the market has been classified into oral examination instrumentation, periodontal therapy equipment & instrumentation, tooth extraction instruments & equipment, and ancillary equipment. The periodontal therapy equipment & instrumentation segment is poised to account for leading share of the global market during the forecast period from 2018 to 2026. The segment is projected to account for market share of 30.0% in 2018, owing to technological advancements in dental scaling and dental imaging techniques. Increase in demand for ultrasonic scalers for animals that efficiently remove calculus and plaques in case of gums or soft tissue inflammation is a key factor likely to drive the scaling equipment sub-segment during the forecast period. In terms of revenue, North America accounted for significant share of the global veterinary dentistry instruments & equipment market in 2017. Increase in pet expenditure as pet owners in the U.S. and Canada treat their pets as a family members propels the veterinary dentistry instruments & equipment market in North America. Rise in the number of privately-owned veterinary clinics and increase in adoption of advanced dental imaging techniques by dental professionals in India and China fuel the growth of the veterinary dentistry instruments & equipment market in Asia Pacific. Geographical expansion of international players into this region through distribution and licensing agreements with local distributors & suppliers is anticipated to augment the veterinary dentistry instruments & equipment market in Asia Pacific from 2018 to 2026. Rapidly developing dental industry in Mexico and favorable international trade for veterinary dentistry equipment in Brazil increase pet expenditure in Latin America. This is one of the major factors likely to boost the growth of the market in Latin America from 2018 to 2026. The report provides profiles of leading players operating in the global veterinary dentistry instruments & equipment market. These include ACTEON Group, iM3Vet Pty Ltd., Dentalaire International, MAI Animal Health, TECHNIK TECHNOLOGY Ltd., Jorgen Kruuse A/S, Dispomed Ltd., Integra LifeSciences Holdings Corporation, Henry Schein, Inc., and Patterson Companies, Inc. Expansion of veterinary dentistry instruments & equipment portfolio by acquiring the business segments of emerging players is a key strategy adopted by key players.